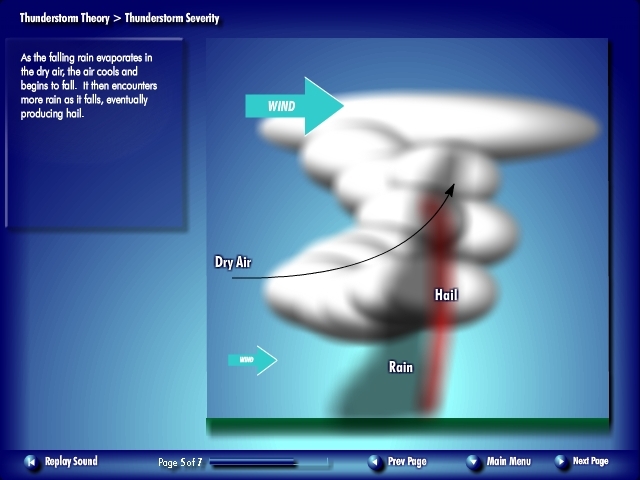 Airborne Radar Training is the only online course teaching the use of airborne weather radar and thunderstorm safety. 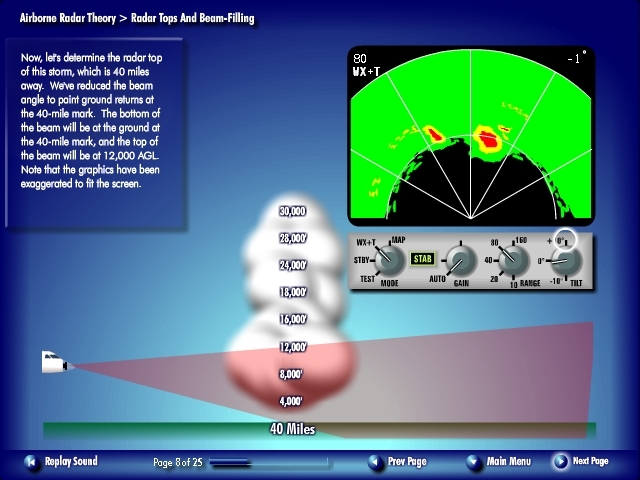 Airborne Radar Training is an online course, teaching the use of airborne weather radar. 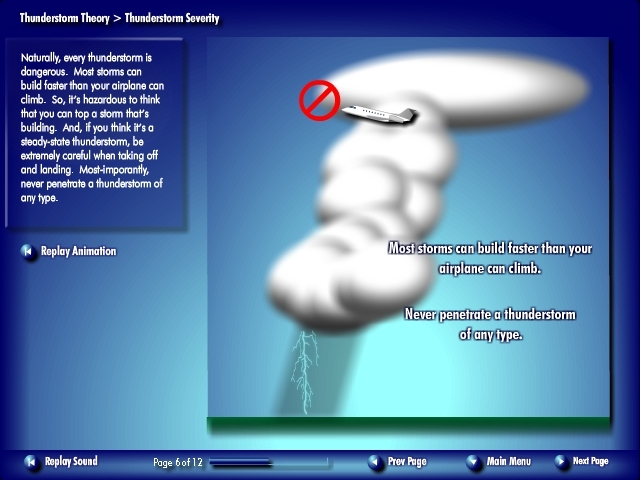 But, it goes beyond use of airborne radar, teaching thunderstorm theory, hazards of thunderstorms, airborne radar theory, and airborne radar techniques. A Final Exam concludes the course, enabling the user to test their knowledge. 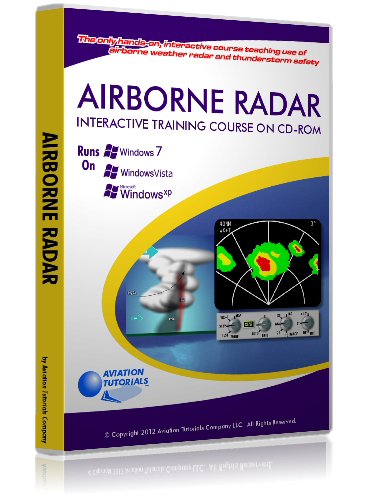 Airborne Radar Training is available to both PC and Mac users. Most seasoned professional pilots will admit that there has always been a lack of adequate weather radar training. The mantra has always been, "fly the airplane, and figure it out as you go." But, there's no reason to continue with that mindset. 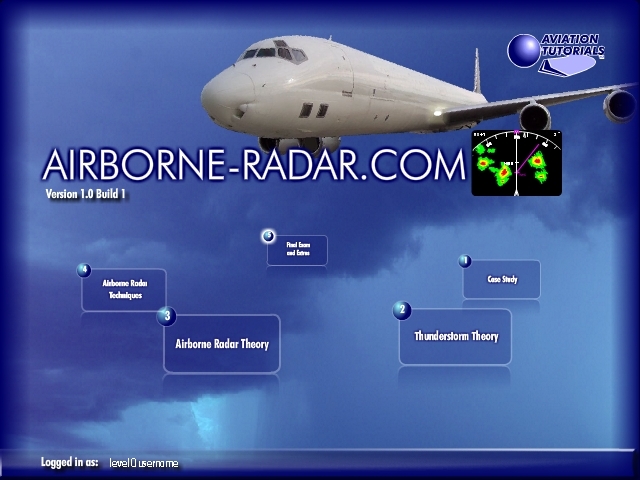 Now, Airborne-Radar.Com provides the only source of thorough, interactive, online training on airborne weather radar. The effective use of airborne weather radar is essential to anyone flying radar-equipped aircraft. 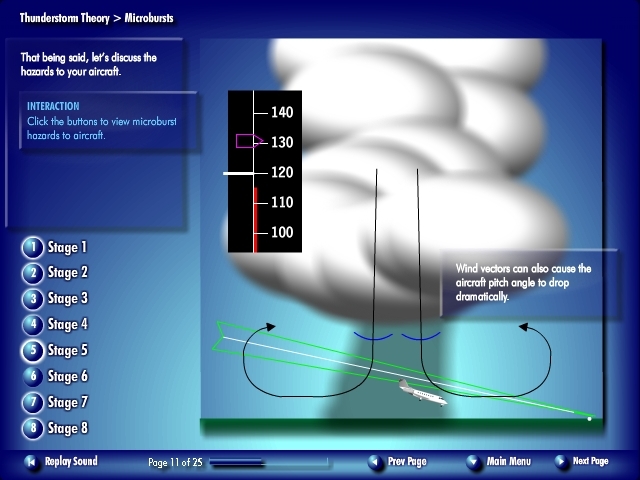 Numerous aircraft accidents have occurred due to flight crews' inadequate knowledge of thunderstorms and the use of radar. 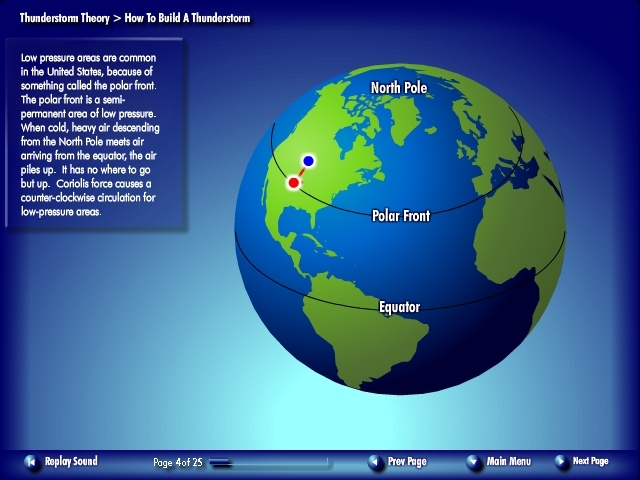 Airborne-Radar.Com helps provide that basis of knowledge. The goal is to provide the best radar training available, to make the pilot confident and knowledgeable about thunderstorm hazards. 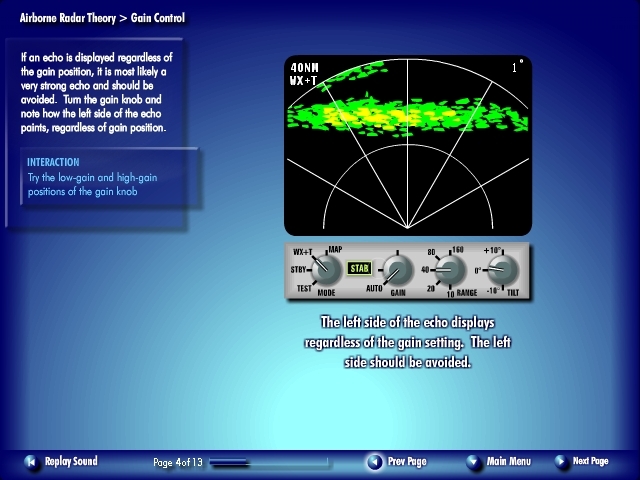 Real, hands-on interactivity enable the user to move knobs, click buttons, and watch the results to provide the best radar training available. Full audio narration and quizzes make learning easy. Who is Airborne Radar Training For? Professional/career pilots seeking to expand their knowledge. Pilots who operate radar-equipped aircraft for their own business. Aviation students aspiring to a professional flying career. Online access, for "anywhere" use on PC or Mac. 26 training modules, comprising more than 3 hours of training. Over 260 instructional scenes, containing more than 50 that are interactive. 50-random-question Final Exam, database-tracked, with printable results. 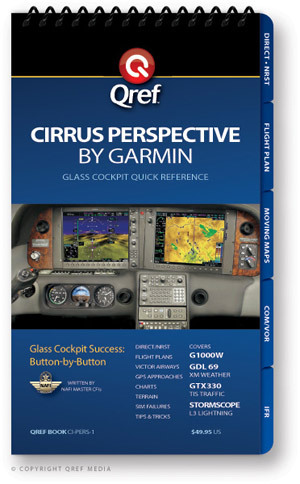 Printable PDF safety documents from the FAA and NTSB. 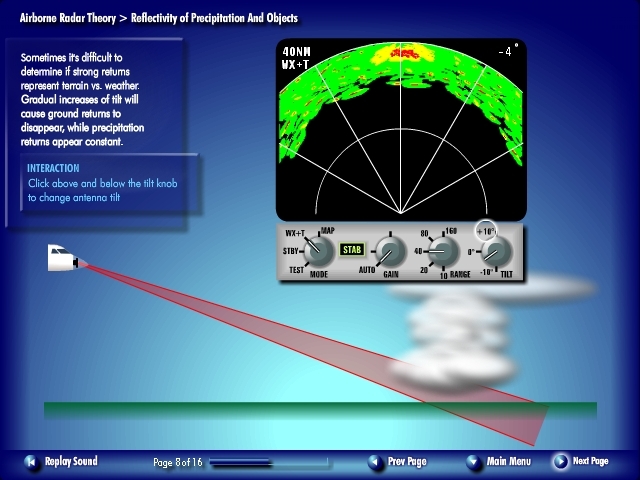 Colorful graphics, depicting simulated radar displays.